Everyone enjoys a spectacular garden with lush greenery and vibrant flowers. Gorgeous gardens are a wonderful addition to compliment a larger landscaping design. Before beginning any garden project it is necessary to survey the landscape and decide where particular types of gardens will look best. Traditional gardens, gardens in a pot, and gardens along driveways are all options to consider. 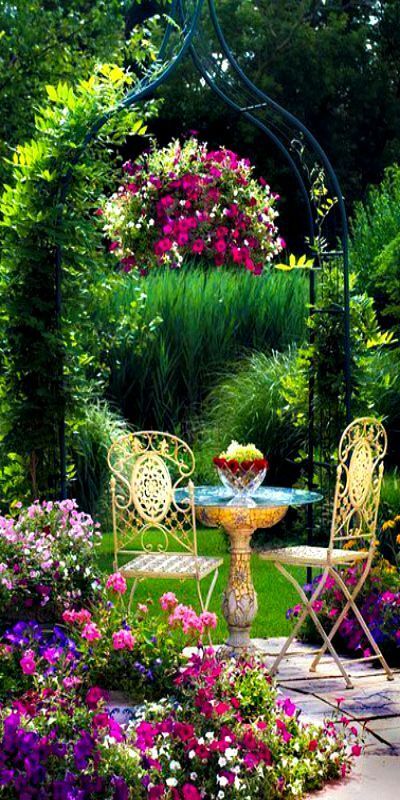 Gardens can be simple or, using a variety of accessories, quite elaborate. 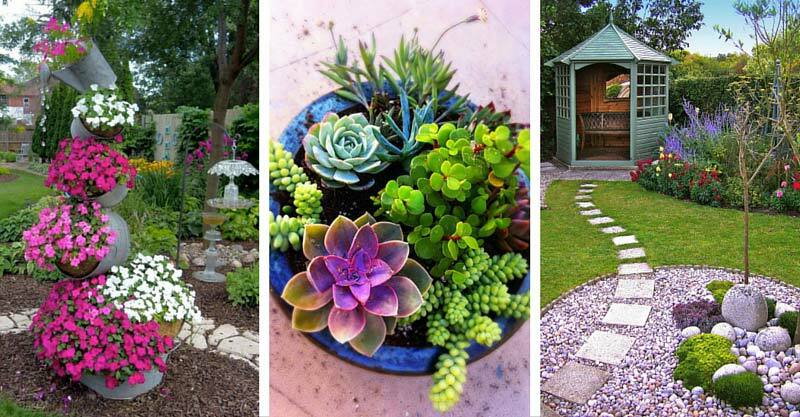 You can let your creativity wild with flower bed ideas, flower pot ideas and planters and extraordinary landscaping. Cultivating and nurturing the soil should be a priority before any planting and designing takes place. Before starting any project all the right garden tools and equipment should be obtained. Once the area is decided upon, ground prepared, and the necessary gardening tools are in place, it is time to plan out and design the actual garden. It is important to take the time to research the types of flowers that grow well in certain climates when deciding what types to choose. Picking the right color combination and learning which types grow well near each other is also an important aspect to keep in mind. But choosing flowers and foliage are just the beginning when it is time to create beautiful outdoor gardens. Everything from intricate tables to rustic watering cans can be arranged to add decoration and style. Stones, rocks, and inlaid patios can be built to surround and lead into the gardens. Water fountains and trellises can also make stunning centerpieces in a garden. When it comes to landscaping and creating a gorgeous garden, the decorating ideas available are nearly endless. The following photos and descriptions describe a wide range of great garden decoration ideas. 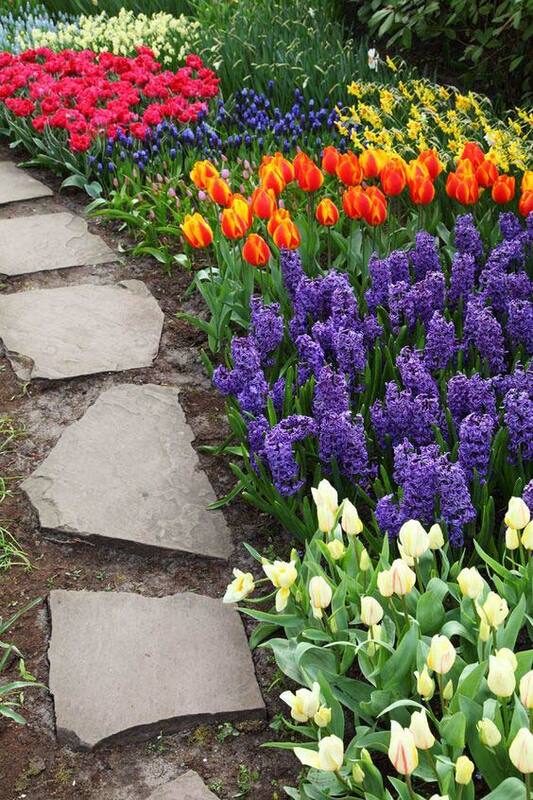 This beautiful stone walkway winds gently alongside a stunning array of flowers. 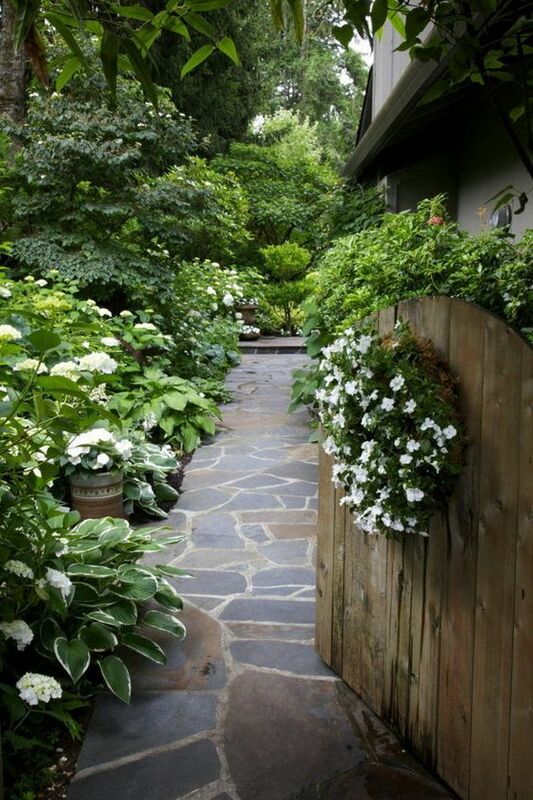 The greenery and flowers flow over the walkway just enough to give it an elegant, lived-in look. The arrangement of flowers and greenery, however, is still neatly kept and not overwhelming. It’s important to note that the flowers closest to the walkway are shorter and closer to the ground. The flowers and plants in the background are taller. This allows anyone strolling alongside this stunning combination of flowers to clearly see everything at once. This particular landscaping scheme uses a variety of stone and rock to create a virtual backyard paradise. The decorative patio and the inlaid sidewalk through the lawn are examples of great garden path ideas. The mini pond with the surrounding rock formation immediately catches the eye. This small body of water is one of the primary focal points of the lawn. Lawn edging is made professionally. The circular steps leading away from the water is a nice compliment to the designs in the patio. 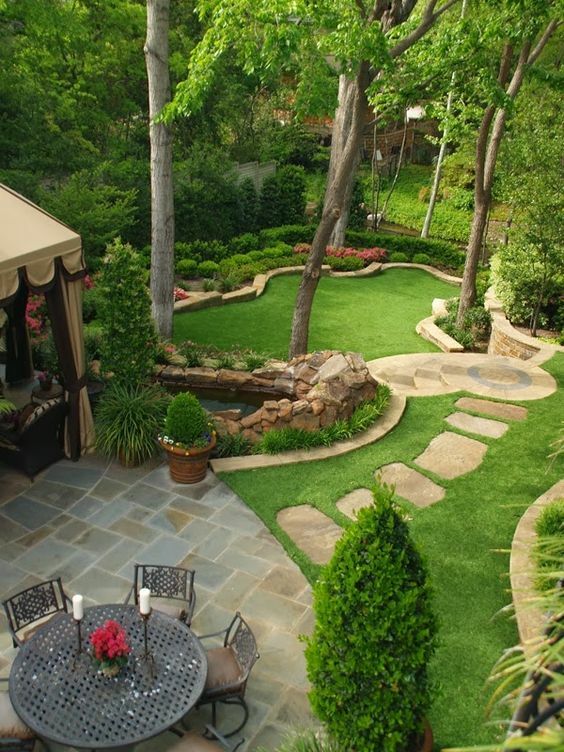 This overall combination of rock, stone, and patio design compliments perfectly the surrounding lawn, shrubs, and trees. This beautiful border along the driveway provides plenty of inspiration for flower garden decoration ideas. Instead of developing a typical square or circular style garden of flowers this stunning border along the drive provides an unconventional design for this gorgeous combination of flowers. 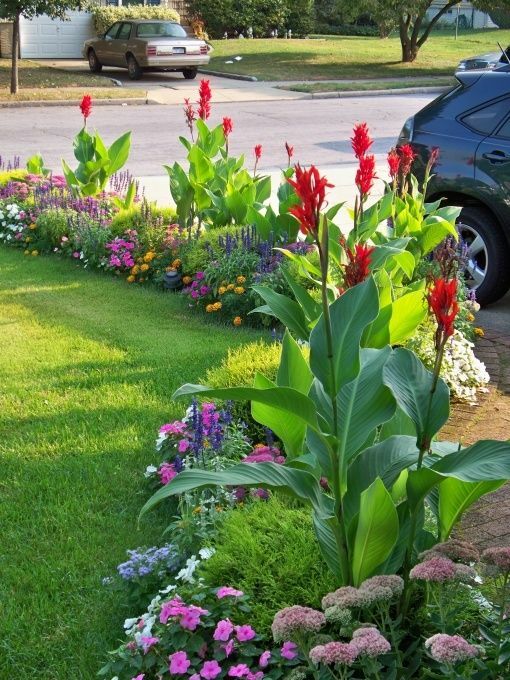 Tall red celosias and incredible fan-shaped tropical leaves are the centerpiece of this detailed border. The combination of smaller flowers in a rainbow of colors provides plenty of detail in the garden. It is hard to go wrong with tulips. This organized display of several colors and styles is simply magnificent. It is important to note that the height of the flowers and greenery is nearly identical throughout the entire path. The texture and size of the actual flowers are similar as well. The neatly arranged flowers stand out alongside the stone steps that are crooked and miss-shaped. When recreating this look it is important to keep the area free of any debris or weeds. Any type of clutter would diminish the “neat and orderly” design of the clustering together of the tulips. This creative design is sure to turn heads in any garden. The rustic buckets arranged in an upward pattern with a cute watering can at the top is a show stopper. The flowers are arranged perfectly as well, with bright pinks, light pinks, and a touch of white for accent. That the flowers completely fill the containers and even flow over the tops a bit gives the entire design a more natural, authentic look. Great idea to use recycled items in your garden. The metal pole with a delicate glass birdbath is a charming addition. It is the perfect combination of a rustic design with a touch of elegance. Adding mulch and pretty white stones instead of grass or greenery completes this incredible garden design. This gorgeous design seems just like a scene out of a romantic movie. The intricate table with the glass top and matching chairs provides just the right touch of elegance. An exquisitely shaped trellis with lush greenery growing throughout is a breathtaking addition. 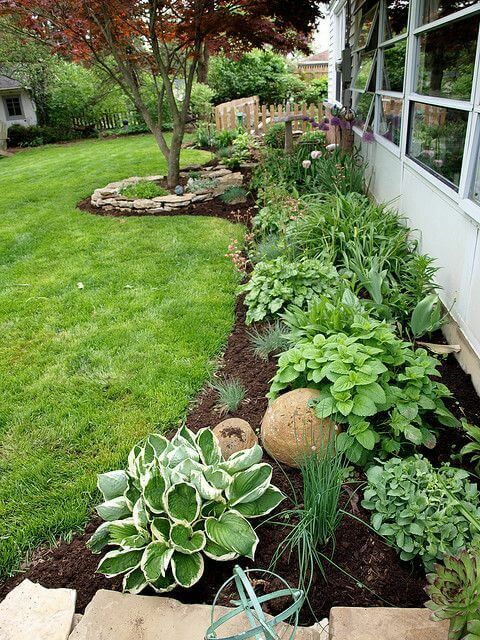 The different variety of grasses and leaves is almost as eye-catching as the several types of flowers growing all together throughout the yard. The long, tall grass flourishing in the background is especially romantic and elegant. While there is a lot going on in this particular design, each element is different and adds something special to the overall design. What an incredible way to surround a home! This particular combination of mulch, stone, along with a beautiful variety of plants, is stunning. The tree is a great part of the design, surrounded by a stack of flat rocks and a touch of green. It is the perfect touch having all these types of foliage right under several windows. Keeping the surrounding lawn lush and green is important so it will continue to compliment the different plants around the house. Those in the home can spend hours relaxing near the window and enjoying the gorgeous scenery right outside. This larger container holds a variety of flowers and leaves, creating a magnificent display of colors, sizes, and textures. The possibilities are virtually endless when putting together a collection of flowers in a single container. It is advised, however, to research which flowers and grasses will grow well together in one pot. What makes this gorgeous container garden work are not only the different types of flowers and foliage but the fact that they are all growing at different heights. 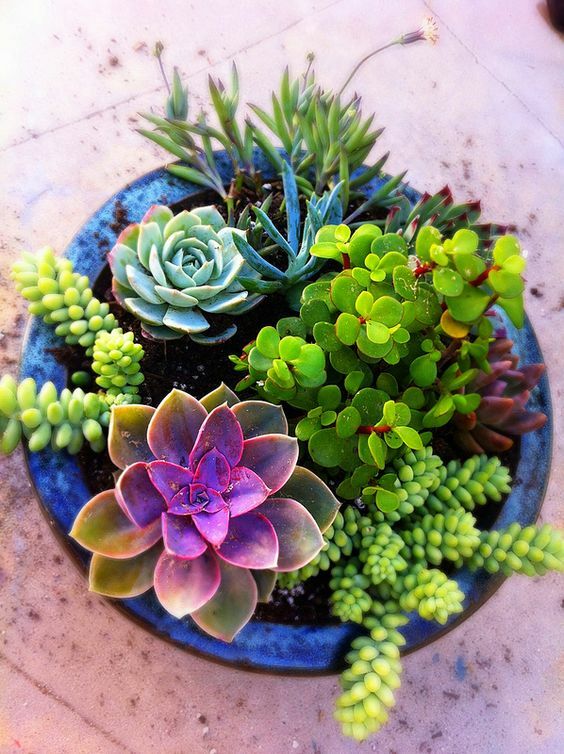 A container garden such as this would look good along the drive, a patio, or on a deck. This is a creative idea that would work well in a garden, on a deck or patio, or even on a large front porch or drive. 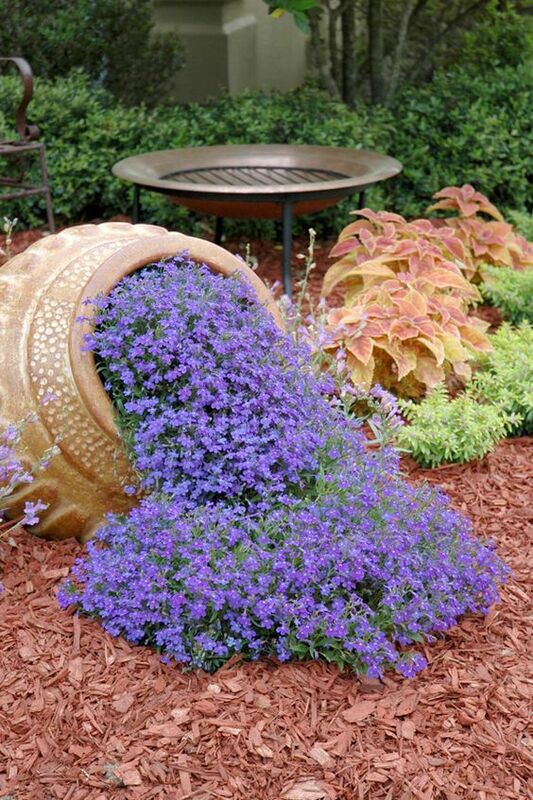 This ornamental pot looks incredible on its side with a large grouping of delicate purple flowers spilling out. While this design would also look good on the lawn, it looks much better when the flowers are laid against mulch. The contrast quickly draws attention to the beautiful array of flowers and the intricate designs on the container. 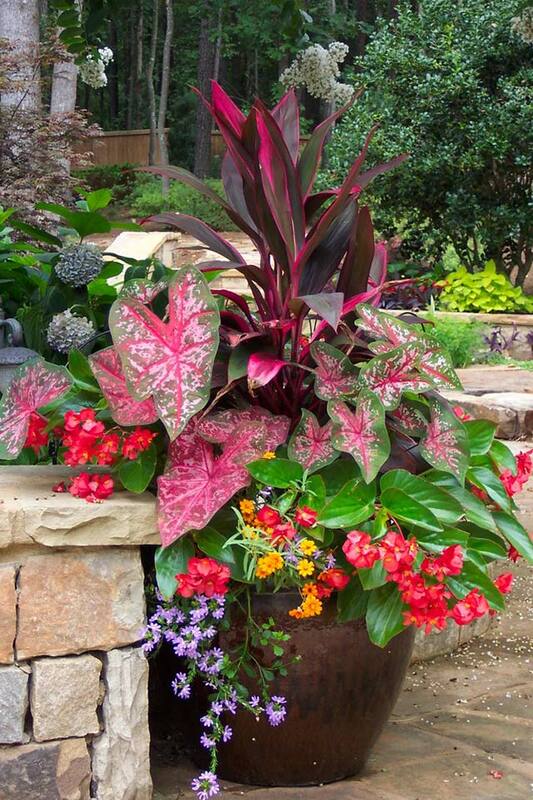 With several colors, shapes, and sizes all blooming together, this garden pot features a lovely group of exotic flowers and foliage. This particular combination has a dessert look, with colors and styles similar to those found in a drier climate. The rustic blue pot offers just the right accent for this group of flowers. This garden pot would be the perfect addition to a front porch or on a backyard deck. 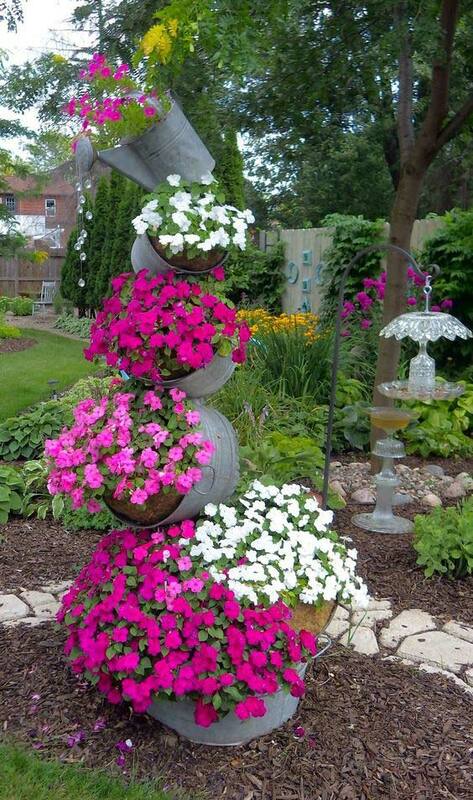 This is just one combination of flowers and style of pot that can be used when incorporating this idea. A pot that is a burnished orange color or a dusty yellow would also look great with these types of flowers and plants. What an incredible combination of pale blues, pastel pinks, and lush greens. Arranging the flowers like a collage in an old wagon wheel is a great idea that is sure to catch everyone’s attention. 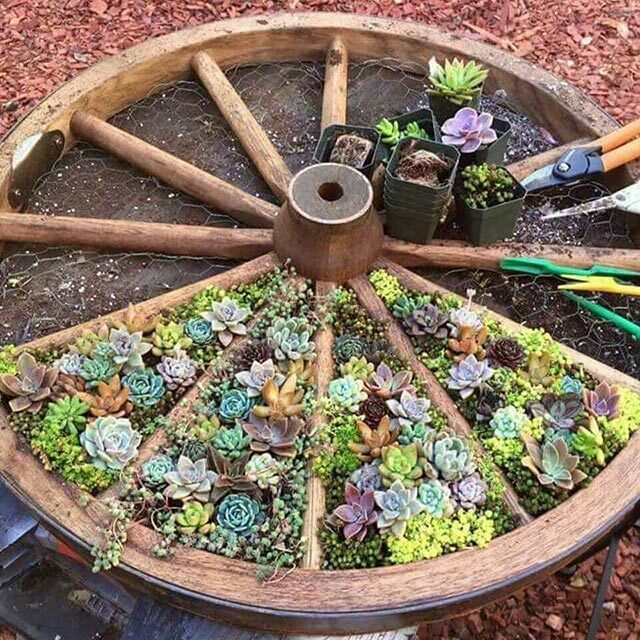 The wheel could be displayed as the centerpiece in a large garden or by itself in a bed of mulch. Keeping the number and types of flowers in each spoke similar will make the geometric pattern look spectacular. It is important to remember that wire netting is used at the base before adding dirt and planting the flowers. While this decorative design would take a fair amount of time to complete, the results would definitely be worth it. 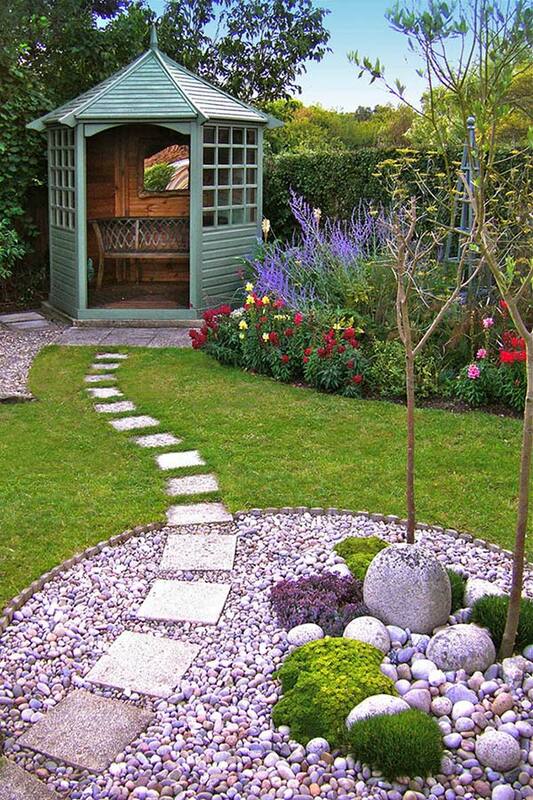 This charming garden path leading to a lovely little gazebo would look incredible in almost any backyard. A pretty rock garden is an eye-catching addition to include along this path that winds through the yard. Finding an elegant bench in the gazebo is the perfect ending for the path. There are just enough small plants in the rock garden to add a touch of needed color without overwhelming the rock formations. The beautiful combination of flowers next to the gazebo adds the right amount of color and style to the overall design.